FORT DRUM, N.Y.—A roomy hangar at Fort Drum in upstate New York, with several helicopters and humvees thrown in, provided the backdrop for the signing of the military funding bill for fiscal 2019. 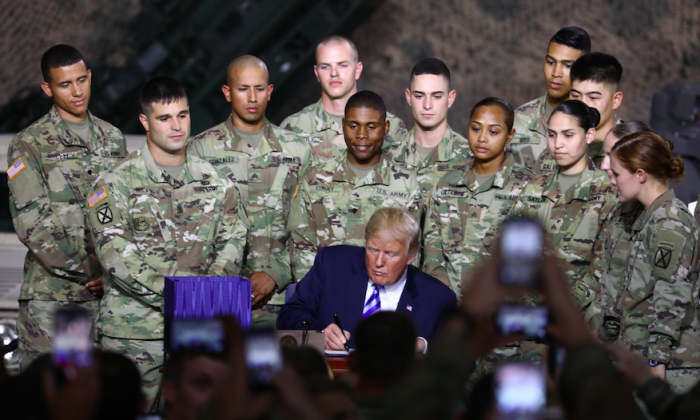 President Donald Trump signed the measure while surrounded by soldiers from Fort Drum, which is home to the Army’s 10th Mountain Division and has deployed more troops overseas than any other U.S. base since 9/11. The $717 billion act provides the Department of Defense with $639.1 billion in base funding, with another $69 billion earmarked for contingency operations and $8.9 billion for mandatory defense spending. 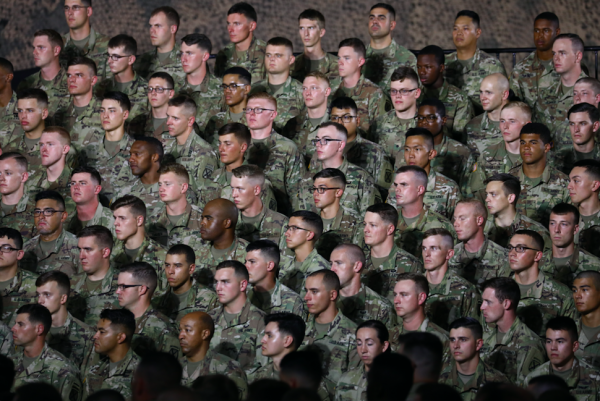 “Hopefully, we’ll never have to use it, but if we do, no one stands a chance,” Trump said, referring to the revitalization of the military under his administration. Under the measure, troops will get their first pay raise (2.6 percent) in around a decade. The act specifies emerging technologies as a threat, such as advancements in artificial intelligence, space and counter-space capabilities, cyber, influence operations, and hypersonics, while also singling out adversaries that include Russia, North Korea, China, Iran, and the ISIS terrorist group. It also supports joint military exercises with Japan, Australia, and India, to specifically counter China’s influence in Asia, Southeast Asia, and other regions. The legislation also authorizes a parade in Washington and a national celebration—something Trump advocated for amid the NFL national anthem protests last year. Vice President Mike Pence attended the ceremony and made opening remarks before the president took the stage.